London: Beleaguered tour operator Thomas Cook Group plc said it had instigated fresh talks with its banks after a further deterioration in its trading performance and cash position left it in danger of defaulting on the terms of its borrowing. Shares in Europe’s second biggest travel firm, which had already lost over 80% of their value this year, slumped 27 pence or 66% to 13.8p, by 0937 GMT, valuing the company, which was once in the blue chip FTSE 100 index at less than £100 million ($156 million). That is in addition to the 100 million pounds short-term credit line that Thomas Cook agreed with its banks following talks in October. “It’s a combination of the trading and its impact on our cash position making covenants tighter. The sensible, prudent thing for the company to do is enter into these discussions with the lenders and make sure we get the additional liquidity," Hollingworth told reporters on a conference call. 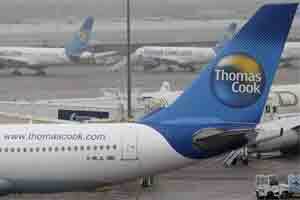 Thomas Cook has issued a string of profit warnings leading to the departure of its chief executive in August. “While the company currently remains in compliance with its financing covenants, it also intends to seek agreement from its lending banks to adjustments that will improve its resilience if trading conditions remain difficult," the group said in a statement.